With a huge salmon fillet in hand, I meandered over to the cupboard to find a suitable marinade. First thing I saw was a little can of pineapple and it just stuck. With the help of some left over tomato sauce that was begging for use I found myself with a pan of pineapple bar-b-que sauce, it's a bit on the sweet side with bits of heat from the poblano peppers, a nice change! It all comes together super easy, by the time the brown rice was cooked, the sauce and salmon were ready. I'm pretty sure you can have this together and in your mouth before the pizza guy can deliver, need I mention that it's much, much healthier too?? 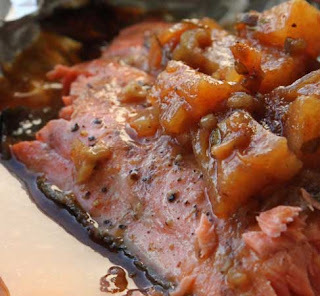 Notes and tips: Grill the salmon on the flesh side on high for a minute, then flip over and place on a piece of tin foil, bending up the sides. Now pour half of the sauce, along with some of the pineapple chunks on top. 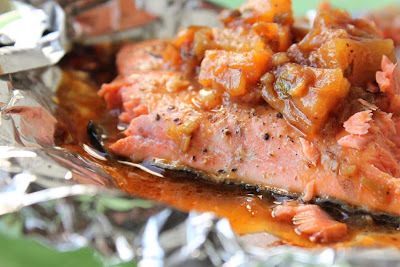 The foil will catch the sauce drippings and caramelize the sides. I was thinking you could try this with a small can of mandarin oranges as well, sounds super! Simmer on low until it's all blended and the flavors have had a chance to meld. (roughly 10 minutes). Oil the grill. Drizzle olive oil on the salmon, season with salt and pepper. Grill flesh side down on high for a minute. Flip onto tinfoil, cover with bbq sauce, close the lid, lower heat to medium and grill a few more minutes. I like my salmon rare, and depending on the thickness of a the salmon, this may only take about 5 minutes. Grill to your preferred doneness. Drizzle remaining sauce on top and serve with brown rice tossed with chopped almonds.